Mondi Propagation Tray’s 1020 are vacuum-molded, plastic flats that measures 11” long, 22” wide, and 2½“ deep. 1020 Flats represent a greenhouse industry standard size. In combination with a wide selection of inserts and accessories (such as the Mondi Mini Greenhouse), they provide a flexible system for starting all crops. 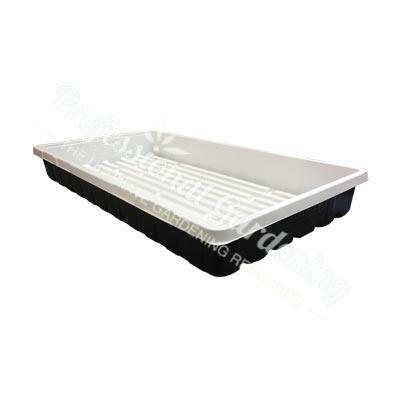 Mondi Clean & Strong premium propagation tray is first and only black & white premium propagation tray on the market. Premium grade virgin materials for cleanliness and durability. Premium white plastic for increased light reflectivity. Black base prevents light penetration to the root zone and reduces the chance of root disease. Best design 1020 flat (standard propagation tray) on the market. Perfectly fits all Mondi Mini Greenhouses.